Grand Smithy Works International SRL, Romania has signed a 5 year contract with ArcelorMittal Hunedoara, Romania to process approximately 13 million MT of slag from the slag dump. Scope of work includes recovery of different sizes & qualities of scrap from the slag and making slag aggregates of different sizes for different applications. Grand Smithy Works International SRL, Romania has signed a 5 year contract with ArcelorMittal Galati, Romania to process approximately 13 million MT of slag from the slag dump. Scope of work includes recovery of different sizes & qualities of scrap from the slag. 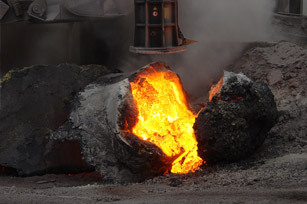 Grand Smithy Works Kazakhstan has signed a 10 year contract with ArcelorMittal Temirtau, Kazakhstan to process approximately 18 million MT of slag from the slag dumps as well as manage the fresh slag in the hot pits inside the plant. Scope of work includes recovery of different sizes & qualities of scrap from the slag at the slag dump as well as the hot pits.